The best conferencing / accommodation solution in-one..
One of the best features of Edward Charles Manor is that we have one of the best conferencing venues in Mossel Bay. The manor can offer tailor made solutions to your conferencing needs as we are able to meet your need for accommodation in Mossel Bay. The fact that we are centrally located means that travelling to different locations in Mossel Bay is quick, easy and effortlessly. There aren’t many conferencing venues in Mossel Bay. Our conference room is available for conferences or private functions. It is able to cater for up to fifty delegates. As each conference is unique, different packages can be created. We are able to do brunch, lunch and tea breaks as requested by the conference host. CLICK TO BOOK YOUR CONFERENCE NOW! Use the safe & secure way to book with us by using our online availability check and booking system. 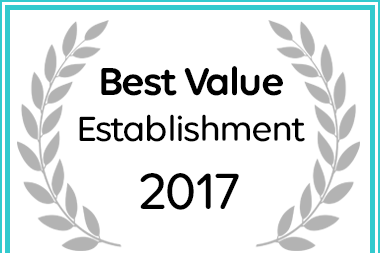 Edward Charles Manor has been named a Best Value Mossel Bay Establishment.